S&S Cafeterias, the Macon-based eatery known for its home cooking and classic southern fare, is closing its last Atlanta area location. The S&S Cafeteria at 2002 Campbellton Road in southwest Atlanta will shutter for good this Sunday, September 30. A sign posted Tuesday on the restaurant's door announces the closure, which WSB-TV reporter Sophia Choi shared on Twitter. The shopping center in which the restaurant is located, Campbellton Plaza, opened in 1955, followed years later by the opening of the S&S in 1968. The center is about three miles from Greenbriar Mall. A restaurant manager indicated that the decision to close the Campbellton restaurant was made following the sale of the restaurant's parent company Smith & Son's Foods to a group of "investors." He said that as of now, the Campbellton Road location was to be the only location closing but that things are still developing. The Smith family has owned the company for its entire existence. In July 2016, S&S shuttered its location at Embry Village on Chamblee-Tucker Road near Tucker. The closure of the S&S, a neighborhood institution since 1973, and other businesses, was to make way for a new large format Kroger Marketplace. Over two years since the restaurant's closure, the giant grocery store is no closer to happening and sources close to the company say it may never happen. In early February 2016, longtime S&S customer Louis Ceruzzi, affectionately known as "Mr. Louis" by S&S Cafeteria customers and staff, opened Magnolia Room Cafeteria. Ceruzzi hired a number of former S&S employees and even purchased some of the furniture and equipment. The Magnolia Room is meant as an homage not only to the S&S Cafeteria, but to the bygone era of the southern cafeteria. Established in Columbus, Georgia in 1936, there were once a dozen or so S&S locations across the south. Today, only six S&S locations remain in operation, of which half are in Georgia, one in Augusta and two in Macon. The other cafeterias are in Greenville and Charleston, South Carolina and Knoxville, Tennessee. 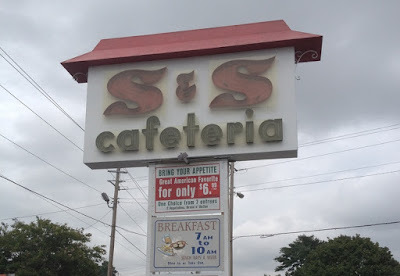 Do you plan to have one last meal at the S&S Cafeteria this weekend? Have you dined at the Magnolia Room Cafeteria? What is your favorite classic southern restaurant in metro Atlanta? I shared many meals at the Embry Hills S&S with family and friends over the years. I was sad to see it close and still miss those sweet potato balls or whatever they called them. I have eaten at the Magnolia Room a couple of times and found it reminiscent of the S&S, but not really the same. They made some odd choices in décor and it seems less like an old southern cafeteria than it does a set from the old In the Heat of the Night TV show. How can they have a Last Supper on the 29th? It isn't even Thursday. I miss the S&S embry hills, although it was taking on a bit of an olfactory funk in recent years. Magnolia room is a bit further, and quite a bit more expensive (no more 99 cent kid's meals), and we don't get to it very often. So sad!! Wish they had a cookbook. Love them as well as Piccadilly! Save Piccadilly! !